A risk/reward profile is the ratio of risk to reward in any given trade as determined by the target closing price and the set stop-loss order. Suppose that a day trader buys 1 share of Company A at $20. The day trader expects the price of the shares to rise to $30 per share, and sets a limit sell order at $30. The day trader then sets a stop-loss sell order at $15 in case the price of the shares unexpectedly drops. On this trade the day traders is risking a $5 loss for a potential $10 gain. This would lead to a 1:2 risk reward profile on this particular trade, as 5:10 can be reduced to 1:2. Most day traders have a standard risk/reward profile for their trades that they use either as a fixed ratio for setting stop-loss orders are as a rough rule of thumb when designing a trade. The idea behind using a risk/reward profile to guide trade development is that it offers a strong and consistent system for setting appropriate stop-loss orders. Day traders should only be risking so much potential losses relative to the potential gains from a trade, and this ratio should be consistent in most trading situations. 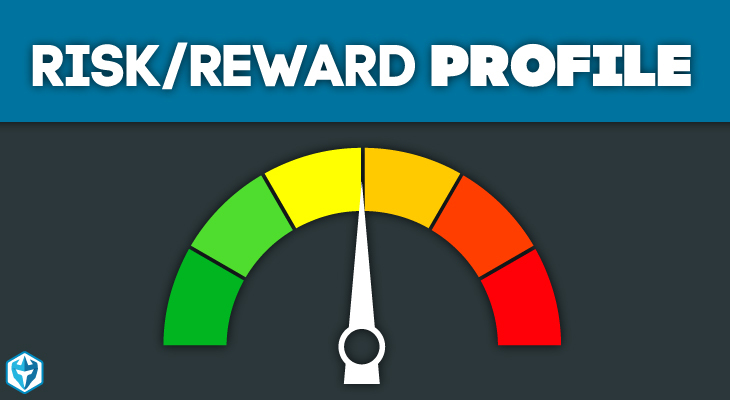 This means that the risk/reward profile also acts as a means of evaluating trades. Imagine that a day trader sees that he needs to set a certain level of stop-loss for a given trade, but is worried that the price could easily trigger that stop-loss before it ever rises to meet his price target. This fear that the mandated stop-loss level will be triggered is a strong signal that this is a poor trade that should not be executed at all in its current state. Different day traders will use different risk/reward profiles based on their trading strategies, but most risk/reward profiles will range between 1:2 and 1:5. Anything below this range is considered extremely risky and anything above is considered highly conservative. Whether the day trader uses their risk/reward profile as a fixed rule or a rough guideline also depends on the individual day trader. In general it is considered a good idea for new day traders to use a fixed risk/reward profile to offer additional structure to their trading, while more seasoned and experienced day traders often feel comfortable using their risk/reward profile as a simple guideline for the basic structure of their trades. Even day traders who have never heard of the exact term ‘risk/reward profile’ will find that they have been using a rough example of the concept to guide the structuring of their trades. It makes sense that an individual day trader and their day trading strategies will demonstrate consistency in how their trades are structured based on their personal risk tolerance and the exact details of how they develop their trades. While it is strongly recommended that new day traders use a fixed risk/reward profile when they start trading, more experienced day traders find that their risk/reward profile becomes more of a rough guideline over time.